Sophie read ASNaC and History of Art at the University of Cambridge and then trained as a conservator at the Institute of Archaeology, University College London. She specialised in the conservation of organic artefacts while working at the British Museum, and developed a sub-specialty in conserving Egyptian polychrome objects, particularly cartonnage. She is especially interested in creative mounting methods for fragile objects. She has been conservator at the Polar Musem, Cambridge since 2012. In early 2017 she spent a field season on Horseshoe Island in Antarctica cataloguing artefacts in the historic 1950's base there. 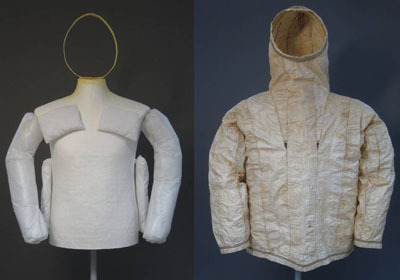 This paper presents a low-cost conservation project from the Polar Museum, Cambridge, in which two Inuit gut parkas from the museum’s collection were prepared for display and analysed to identify their material components. The project relied on cultivating professional networks and adapting inexpensive mounting methods to get maximum value from a very small budget. The parkas were analysed with a range of techniques including scanning electron microscopy (SEM), energy dispersive X-ray spectrometry (EDX), attenuated reflectance Fourier transform infrared spectroscopy (ATR-FTIR) and a novel low-cost and non-destructive protein analysis technique to identify species. The results of the analysis are presented along with an explanation of the inexpensive mounting system which was devised to display the parkas as they were originally worn. The advantages and limitations of using a networking approach to analysis are also discussed. The cost of conservation means that small museums often face financial challenges in getting objects fully treated for display. Even if a museum is fortunate enough to have an in-house conservator, they are unlikely to have sophisticated analytical equipment which can provide enriching information about artefacts. However, a surprising amount can be achieved on a shoestring budget, by cultivating networks and adapting low cost treatments effectively. In the project presented here, two gut parkas from the Polar Museum in Cambridge were conserved and studied in preparation for display, so that they, as well as other light-sensitive Inuit clothing items in the permanent gallery, could be rotated regularly to reduce their cumulative exposure to light. At the same time, the parkas were examined and analysed with a range of low-tech to sophisticated techniques to understand more about their characteristics and make this information available to the public and researchers. All the conservation treatments, and much of the analysis of the parkas, was carried out by three of the authors while they were on student placements at the Polar Museum in their final year of the University College London (UCL) Institute of Archaeology MSc conservation programme. Display space and budgetary constraints meant that the conservators had to think creatively to develop inexpensive conservation treatments and archival tailored mounts for displaying the parkas. The budget for analysis was also very small and the in-house facilities extremely limited. However, they were supplemented by tapping into a network of facilities and expertise available through the UCL students themselves and professional colleagues at the University of York. By using these research networks, the parkas could be more thoroughly investigated using scanning electron microscopy (SEM), energy dispersive X-ray spectrometry (EDX), and attenuated total reflectance Fourier transform infrared spectroscopy (ATR-FTIR). The parkas were also tested using a newly developed protein analysis technique, which is a non-destructive alternative to DNA analysis, to identify the species of animal used to make the parkas. This paper presents both the results of the analysis and the low cost conservation mounting system devised for the parkas. The project highlights the benefits and limitations of using a networking approach to object analysis in a small museum context. The gut parka is a garment which was traditionally made by sea-hunting peoples all across the Circumpolar North. It is a lightweight waterproof coat made from strips of dried sea mammal intestine, which was worn over normal clothing. Often gut parkas were used to keep hunters dry when hunting from a kayak, but, in some cases, they were ceremonial garments used for shamanic healing rituals or for dancing and celebrations (Reed 2008). The appearance of gut parkas varies widely depending on their intended use, where they originated, and how they were prepared. Both gut parkas in the Polar Museum collection originate from the Kalaallit culture of Eastern Greenland. They are thigh length, with wide sleeves and a hood, and were worn over normal warm clothing. Traditionally this would have been a fur or bird skin parka (Buijs n.d.), but in the 1930’s, when they were collected, it was also likely to have been a knitted European style jumper. Parka N: 233 (Figure 1) was donated to the museum in 1939 by Henry Iliffe Cozens, an RAF Air Commodore who in 1930–1 was the photographer and filmmaker for the British Arctic Air Route Expedition (BAARE) to Greenland (Bowman 2015: p. 208). Museum records show that the parka was originally the Sunday wear of Pastor Rosins in Tasiilaq, East Greenland (formerly known as Angmassalik), and was later acquired by Cozens. Parka N: 233 before conservation treatment. It was collected in Tasiilaq in 1930–1, and was donated to the museum in 1939. Photo: ©Scott Polar Research Institute, University of Cambridge. 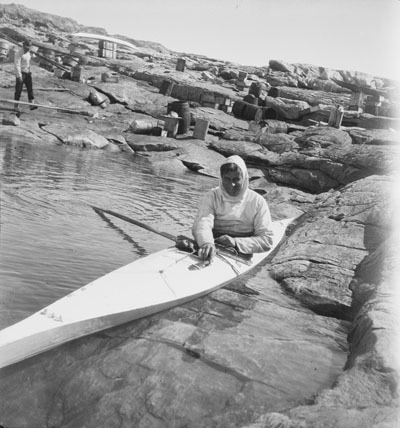 Numerous photographs from the expedition (accessible at http://www.spri.cam.ac.uk/picturelibrary/catalogue/baare/) show not only Inuit men kayaking in such parkas (Figure 2), but also several members of the expedition, who clearly enjoyed the activity and even learned to do kayak rolls while wearing the parkas (Figure 3). 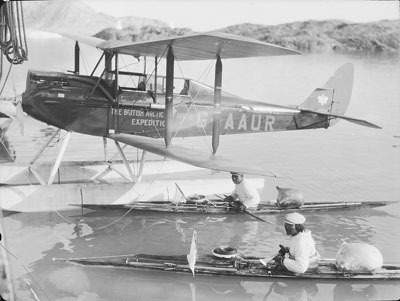 Inuit kayakers with an aircraft from the British Arctic Air Route expedition (BAARE) 1930–1. Photo: ©Scott Polar Research Institute, University of Cambridge. A member of the BAARE expedition (possibly Henry Iliffe Cozens) wearing a gut parka while kayaking in Greenland 1930–1. Photo: ©Scott Polar Research Institute, University of Cambridge. The other parka (accession no: Y: 2011/79/1) is known as the Wager parka and was given to the Polar Museum by descendants of botanist Harold Wager, who travelled to Eastern Greenland in 1936–7 with his brother, Lawrence, a geologist, and both their wives. Lawrence had also previously served on the BAARE, and so was already familiar with Tasiilaq, where the family spent the winter of 1936–7. The second parka, therefore, seems to originate from the same area and is almost the same age as N: 233. 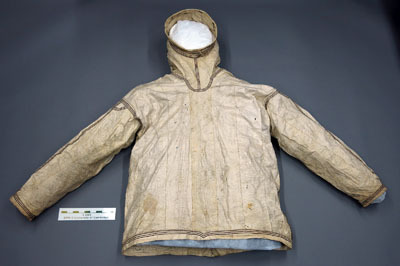 The Wager parka came to the Polar Museum in 2011 in a large wooden crate, containing numerous Kalaallit garments and objects, and among these the gut parka was found rolled up tightly (Figure 4). A spare strip of rolled gut, identical in colour and texture to the parka itself, was also in the crate. The Wager parka was rolled up tightly when it first arrived at the museum in 2011. Photo: ©Scott Polar Research Institute, University of Cambridge. The photos from the BAARE showing similar parkas in use and patterns of wear on the sleeves indicate that both parkas were working garments intended for use in a kayak while hunting, and were not intended for ceremonial use. The two Polar Museum gut parkas are designed to protect the wearer from wind and water while being generously cut around the shoulders to allow freedom of movement during hunting. To keep out the elements, the coats have no front opening, a high neck line and a loose hood that can be fastened around the face. The stitching method is also crucial for insulation. Waterproof rolled seams are made by over-sewing with small stitches of sinew thread which swell when wet, closing the holes left by the needle. The cuffs, hood and lower hem are finished with thin strips of de-haired black skin in a unique pattern on each parka. This appears to have a practical as well as decorative purpose, as it stiffens and strengthens these areas. Around the face in particular, the black strips keep the hood more rigid and prevent it from sagging into the kayaker’s eyes. In East Greenland, these strips were often made from seal skin (Buijs n.d: p. 13), but this was not analysed for these parkas. Gut skin is the collagenous connective tissue made of hyaluronic acid, cells and fibres, which is found between the inner layers of mucosa and outer muscle layers of the digestive tract. Both intestines and oesophagus of sea mammals are used to make parkas. Issenman (1997: p. 74) reports that the small intestine of one adult bearded seal, at over 20 m long, is sufficient to make a whole adult’s raincoat. To prepare the gut for use, the outer muscle layers are stripped off manually using the thumbs and the intestine is turned inside out. The inner mucosa layer is then removed with a blunt tool and the skin is repeatedly soaked in water and urine, then scrubbed clean. This process effectively removes the hyaluronic acid and cells from the material so that only collagen fibres remain (Florian 2007: p. 30). The tube is blown up, tied at both ends and hung in the open until it is dried. The dried tube is then split longitudinally and rolled up in bundles, ready for use in a range of items including windowpanes, bags and garments (Blumenstein 1987: pp. 23–27). The dried gut is used in the same orientation as in the living organism, so that the inside of the gut skin is the inside of the parka (Issenman 1997: p. 73). In a live animal the inside of the gut is covered in villi, small finger-like projections which actively absorb nutrients and allow them to pass across the gut wall to the rest of the body. By contrast, the outside of the gut is smooth and does not allow anything to pass back into the gut from outside. When gut skin is dried out, capillaries close rendering the outside waterproof while still allowing humidity to escape from the inside (Morrison 1986: p. 17). These characteristics of the connective tissue make the garment breathable. Images of samples of the Polar Museum parkas at 160×magnification are consistent with this account of how the gut is orientated in the garment. 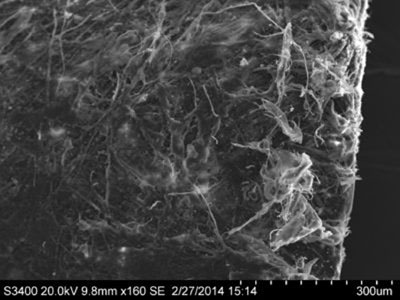 Samples from both parkas were examined in a Hitachi S3400 Variable Pressure SEM at UCL, which conservation students are able to use during their work placements. The images show that the outside of the parka is much smoother than the inside. The inner surface does not show villi as such, since these were presumably destroyed when the gut was processed and dried (Figure 5), but it is nevertheless noticeably fibrous compared to the outer side (Figure 6). SEM image of the inner surface of the gut from the Wager parka at 160× magnification. Micrograph: University College London. SEM image of the outer surface of the gut from the Wager parka at 160× magnification. Micrograph: University College London. Gut skin is a thin, soft, pale-coloured material resembling very fine parchment, which is also made primarily of collagen. Like parchment, gut skin is stretched taut during the drying process. In parchment, this stretching causes a reorganisation of the collagen fibres into roughly aligned layers that are parallel to the grain surface (Reed 1972: p. 120). Drying fixes this network, which can, however, change as a result of humidification. 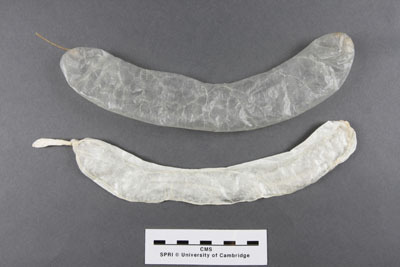 Experimental drying of natural sausage casings made from lambs’ small intestine at the Polar Museum showed that inflation resulted in stretching to over three times the size of the skin in a relaxed state. The collagen fibres may, therefore, have also become roughly aligned during the processing of gut to make parkas, though this hypothesis has not been investigated during this project. Textual sources state that gut parkas can be made from seal or walrus intestines, and that people familiar with both can identify them by the width of the strips in the parka construction. This is because the “bore size” of adult walrus intestine is much bigger than that of adult seal (Burns 1987: p. 28). However, visual identification would be prone to error if walrus gut were used from an animal not yet fully-grown. Instead, protein analysis (or proteiomics) was used to identify the gut material at species level. The analysis was carried out by BioArCh at the Department of Archaeology, University of York, using a novel minimally destructive sampling technique developed there for analysing medieval parchments (Fiddyment et al. 2015). Proteiomics uses mass spectrometry to measure the mass of different peptides in a sample and create a fingerprint which is characteristic of a particular species (zooarchaeology by mass spectrometry or ZooMS). 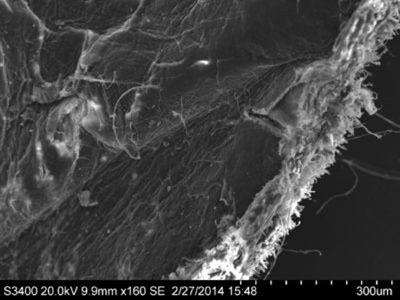 Previously, the protein required was obtained by destructive sampling, but the BioArCh group at York have devised a method of extracting protein from a surface using the electrostatic charge generated by rubbing an object gently with a PVC eraser (triboelectric extraction). This was the technique used to sample both gut parkas at the Polar Museum. The method is non-destructive except for very mild abrasion to the surface, and has been used on hundreds of medieval parchments in the BioArCh study of vellum used in 13th century Bibles. The parkas were both sampled by rubbing a new PVC eraser 40 times over a small area inside the garment, and collecting the crumbs in a sample tube. The results of analysis indicate that both parkas were made from bearded seal intestine. A significant amount of keratin was also present in the samples. It is unclear whether this is due to contamination from storage where the parkas have been in close contact with fur clothing, or from fur or wool garments worn inside the parkas in the past. Protein analysis is a highly specialised technique but where it is available it provides a highly cost effective alternative to DNA analysis. While DNA analysis provides very detailed information about an individual animal, in many cases this would not add greatly to understanding an artefact when all that is required is species identification. At the time of the analysis in 2014, DNA analysis cost in the region of £150 per sample, whereas protein analysis cost about £20 per sample. For this project the protein analysis was done free of charge through the mutual benefit of professional networks. The parka samples were used by the University of York for testing their non-destructive sampling technique while it was being developed. The Polar Museum also contributed samples to a different research project at the University of York Department of Archaeology at the same time, so both institutions benefitted from the analytical work. 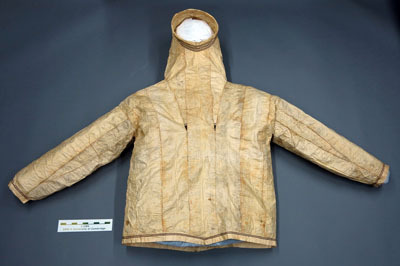 Both gut parkas at the Polar Museum are opaque, in contrast with many parkas in other collections which are rather translucent (Reed 2008, Cruickshank and Gomez 2009, Jackson and Hughes 2009). Various sources indicate that this was due to the season when the gut was prepared (Reed 2008, Lin 2010). A method known as winter tanning is reported to result in a more opaque material with a satiny quality, whereas gut prepared in the summer is more translucent. In summer the cleaned gut dries naturally in air above 0°C, whereas in winter the gut freezes as it dries and so is effectively freeze-dried. Winter tanning was used by the East Kalalliit who prepared the Polar Museum parkas, and was also used by Siberian Yupiit (Issenman 1997: p. 1982). A simple test using sausage skins made from lamb’s intestines reproduced the different appearance between the two preparation seasons readily. When inflated and dried in air the intestine dried translucent, whereas when frozen for a week it dried to an opaque and slightly silvery pale colour (Figure 7). Comparing sausage skin which has been air dried (top) as opposed to freeze dried (bottom). Freeze drying resulted in a more opaque and silvery appearance. Photo: ©Scott Polar Research Institute, University of Cambridge. The different appearance of winter and summer tanned gut seems to be due to the effect of freezing on collagen. Fresh collagenous material, such as gut skin, has a moisture content of around 90 per cent, though much of this water is bound in very fine capillaries and 45–60 per cent does not freeze even at temperatures of –50°C (Dehl 1970). During freezing, the remaining water forms ice crystals that expand in volume by around 8.5 per cent, causing ruptures in the organic membranes (Florian 1990) and making the material more porous. Freezing also reduces the shrinkage temperature of collagen (Williams et al. 1995), which would be likely to weaken the fabric of the gut. The damage caused by freeze drying probably explains why some communities kept winter tanned parkas ‘for show’ as they were considered less resistant to weathering (Burns 1987: p. 29). The increased porosity of freeze-dried gut would also increase the amount of light scattered from the surface and make it appear more opaque (Fox 2001). While the parkas show many similarities in terms of manufacture and decoration, the gut itself looks and feels very different; N: 233 is much paler, more translucent in places and more flexible. Several signs show that N: 233 was in use for some time: areas of the sides where arms would have brushed against the body are thin and worn; cuffs and elbows are dirty. Stains cover the front of the main body, the largest being dark brown. This stain appears black under ultra-violet light, suggesting it has high iron content and may be a blood stain acquired during use. Meanwhile the Wager parka is much stiffer and appears not to have been used very often, if at all. It is also noticeably yellow in colour (Figure 8). The Wager parka unfolded after humidification and reshaping. Photo: ©Scott Polar Research Institute, University of Cambridge. Some of the differences between the two parkas are undoubtedly due to their level of use. As well as becoming worn and grimy, N: 233 has been subjected to repeated wetting and drying during use, perhaps including freeze-drying. It will also have suffered photo-deterioration from exposure to the sun, and mechanical stress from being worn. The gut itself is not homogeneous and was processed by hand. The combination of deterioration factors has apparently affected various areas differently. Repeated cycles of wetting, drying and freezing may account for patches on the parka which are more translucent or more flexible than neighbouring areas. By contrast, the less-used Wager parka is much more uniform in colour and texture. The most striking difference between the two parkas is their colour. There are several things which could account for the yellowness of the Wager parka. One possibility is that blood in the intestine was not thoroughly washed out during preparation of the gut, and has left a residual colour. This hypothesis was tested using EDX to determine the elements present in samples from N: 233 and the Wager parka. If there was residual blood in the gut, one would expect to see elevated iron levels in the Wager parka and not in N: 233. The analysis was carried out at UCL in the same SEM machine discussed in section 3.1, which has EDX capability. Spectra were gathered from 3 different sites on each sample, and each set of results was an average from 3–5 iterations. 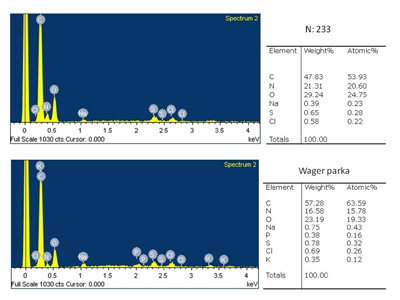 No iron was detected anywhere on either parka (Figure 9) which shows clearly that residual blood contamination is not the reason for the yellow colour of the Wager parka. The main elements detected were carbon, oxygen and nitrogen, which are three of the four major constituents of the proteins that make up collagen (the fourth constituent, hydrogen, is not detectable by EDX). The other elements detected in the samples were only present in trace amounts and are likely to be partly due to contamination during preparation and/or use. For example, sodium and chlorine detected in both objects may be partly due to seawater wetting the parkas during use. Results of SEM EDX elemental analysis for both parkas. No iron was detected in either one. Spectrograph: University College London. Another possible reason for the yellow colour of the Wager parka is that a coating of oil was applied at some point, either during preparation and use, or after it was collected. There are accounts of the Nunavit soaking bearded seal intestines in oil before drying (Nungak 1983: p. 120). Although there are no references in the literature to routine maintenance of gut parkas specifically, seal oil may also have been applied to keep the material waterproof, as was customary with seal skin boots (Buijs n.d.: p. 12). Both parkas were spot tested with swabs of white spirit to see if any coating could be detected, but the results were inconclusive. Samples from both parkas, as well as a sample from the spare strip associated with the Wager parka, were, therefore, analysed with FTIR at UCL to determine whether a coating was present. The instrument used was a PerkinElmer Spectrum Two IR Spectrometer, and the samples were analysed using ATR with a diamond base plate. A sample of sausage skin that had been cured in brine, then thoroughly washed, was used as reference, as it is composed of nearly pure collagen. Each spectrum was produced from 10 scans, with a resolution of 4 cm–1. Each sample was analysed three times to ensure the spectra were representative. The results are shown in Figure 10 and Table 1. Results of FTIR spectroscopy. Spectrograph: University College London. Table of FTIR wavelength peaks (cm–1). Results are shown from the two parkas, the spare strip from the Wager parka, and a sausage skin reference sample. The representative peaks for collagen are present on each sample, specifically the wide trough of a carboxylic acid and amide in the region 3600–2800 cm–1, the Amide I peak occurring at 1630 cm–1 and the Amide II peak at 1540 cm–1. The fingerprint region from 1500–500 cm–1 displays the pattern of small bending vibrations in the sample, and is characteristic for every molecule. With the reference representative of gut collagen in good condition, it is evident that the sample from N: 233 is chemically in very good condition; the spectra are nearly identical throughout the fingerprint region with only very slight displacements of the major peaks in the carboxylic acid region. The Wager parka also has a spectrum very representative of collagen, but, in this case, there are differences from the reference. Both samples contain an extra small, sharp peak located at 3690 cm–1. The spare strip sample mostly conforms to the peak locations of the reference but with small changes to the intensity of some peaks in the fingerprint region, notably from 1080–1030 cm–1. The Wager parka sample has other differences, including a wider trough in the carboxylic acid region with multiple peaks, and extra peaks in the fingerprint region from 1000–500 cm–1. This suggests some wider variation in the chemical environment than in typical gut collagen, possibly due to chemical deterioration and the breakdown of the collagen structure. There is no evidence in any of the samples of peaks associated with an oil or fat which might have been used as a coating. Typical collagen deterioration due to aging is caused by oxidation of amino acid chains and hydrolyzation of collagen fibres. These chemical processes can be characterized in FTIR spectra as differences in the relative intensity (AI/AII) and location (Δv) of the Amide I and II bands (Badea et al. 2008). In the case of the Wager parka and N: 233, the degrees of oxidation and hydrolysis described by these classifications are nearly identical (Table 2). Table comparing the relative intensity (AI/AII) and relative locations (Δv) of the Amide I and II peaks, corresponding to the degree of hydrolyzation and oxidation of the collagen structure. Results are shown for the two parkas and the sausage skin reference sample. The FTIR results indicate that the collagen of the Wager parka is more deteriorated than of the N: 233 parka, but not necessarily as a result of the typical deterioration mechanisms of collagen aging. Instead, the deterioration may have been caused by mould growth, as white mould was found widely distributed on the surfaces of both the Wager parka and the spare strip when they came to the museum. Mould produces various metabolic by-products as it grows, which can cause degradation of organic substrates along with yellowing (Florian 2002). It can cause proteolytic deterioration, and produce pigments and organic acids that cause discolouration (Sterflinger and Piñar 2013). The aim of conservation treatment for both parkas was to stabilise them to allow safe handling and to improve their appearance so that either could be displayed in the permanent gallery on a rotating basis. Whichever parka was not on display would also be used in occasional supervised public sessions for different audiences. These aims meant that conservation support mounts were needed for both parkas. One mount system would be used for display while the other would be designed to maintain the shape of the parka lying flat in storage and during events, when it would be moved around within the museum building and displayed on a table top. Before treatment, the parka was quite crumpled, the hood being particularly deformed. Various parts were badly deteriorated, with two large tears present on the back, smaller ones on the front, and a large split close to the proper right armpit showing an old repair in beige thread. A big tear ran around the U shaped decoration on the hood. Holes were visible on the entire surface as a result of pest activity during storage, and some areas were weakened by the presence of many holes close to one other, particularly on the back. Frass and moth cases were still present on the surface. After dry cleaning using a soft brush, low powered vacuum cleaner, and Boots cosmetic sponges (polyurethane foam), the deeper creases and folds were reshaped through local humidification and the use of constraints during drying. Areas requiring repairs were also humidified and smoothed out to facilitate alignment. Backings were applied to the tears, using Tengujo 5gsm long fibre tissue and a 10 per cent w/v sodium alginate and arrowroot starch and water paste. This treatment system was chosen after testing several combinations of backing materials and adhesives on freeze dried sausage casings. Goldbeater’s skin, outer membranes of bovine large intestine, and Tengujo tissue all gave good results, but Tengujo was ultimately chosen due to its greater ease of use, closer bond and better visual match with the surface. The backing technique was also used to reinforce small areas which were particularly weakened by pest damage, and to reattach a strip of de-haired seal skin to the back. As dry gut skin is quite brittle, relative humidity was raised to 60 per cent for the whole garment during treatment to ensure safe handling. Small padded weights were placed on the backed areas to avoid buckling during drying. Internal supports for long term storage of N: 233 were made using thin sheets of Plastazote (closed cell polyethylene foam) cut, folded, sewn together and covered in Bondina (non-woven polyester sheet) to ensure a smooth surface. These lightweight, hollow supports were fitted inside the main body and arms. A cushion was made for the hood using strips of Plastazote bent and interwoven to form a sphere, which was stuffed with polyester wadding and covered in a tailor made Tyvek case (flashspun high density polyethylene fibre). Before treatment, the gut skin was brittle and stiff, and could only be partially unfolded. White mould was present in some of the creases. Once humidified and unfolded completely, the object appeared to be in relatively good condition with no signs of use or previous treatment. Gentle surface cleaning was done in the same way as for N: 233, to remove surface dirt and visible traces of mould. The parka was placed in a purpose-built polythene humidity tent, in which relative humidity (RH) was gradually raised to 85 per cent and then lowered back to the normal ambient levels (45–55 per cent) over the course of three days. Internal supports made of acid free tissue, Plastazote or inflated vinyl gloves covered in Tyvek were used to gradually reshape the garment during humidification. The treatment was repeated in order to reduce the deepest creases further, smooth out the hood and cuffs, and lower the sleeves to a more natural position. The Wager parka was chosen for display in the permanent gallery. Gut parkas are often displayed with the arms outstretched (Cruickshank and Gomez 2009; Jackson and Hughes 2009), but space in the showcase did not allow this. Instead, the sleeves needed to be moved down close to the sides of the parka and bent slightly at the elbows in order to fit. This provided an opportunity to display the parka in a position that would illustrate how it appeared when worn. The parka was humidified for 18 hours over 4 days at 85% RH to gradually reposition the sleeves and create a slight bend in the elbow. The torso was rounded out as well. The parka was supported externally and internally with Plastazote and acid-free tissue during humidification. Although the parka was in good condition, care was taken to minimize the creases and folds in the material. The width of the parka was repeatedly measured during humidification to ensure that it would fit in the display case with the final arm position. The parka required a custom mount to fully support the shoulders and hood, and maintain the shape of the arms while relieving any strain on creases and seams. Once the parka was reshaped, it became somewhat inflexible. The sleeves could not be moved more than a couple of centimetres without straining the material and, therefore, could not be manoeuvred onto a typical mannequin or mount with attached arms. Instead, the sleeve supports needed to be detachable so they could be inserted into the sleeves separately without moving the parka. The parka is light sensitive and will be rotated off display. To minimize movement and handling of the parka during installation and de-installation, the mount was also designed to function as a storage mount, with the parka lying on its back. This meant that the mount needed to be archival, lightweight and able to maintain its shape upright or lying down. The budget for mounting was very limited, so a bespoke mount made by an external contractor was ruled out in favour of a solution made in-house by a conservator. Materials such as Perspex, polystyrene, pre-fabricated mannequins, and paper maché were all considered. A combination of paper maché and padded wire were determined to be most suitable for the parka as they were lightweight, rigid, inert and inexpensive. The mounting method was based on that described by Supianek and Ganiaris (2013), and was adapted and extended to suit the project requirements. The mount was constructed in three separate sections: torso, sleeves and hood. A Peltek (spunbonded polypropylene) toile of the parka was used to check the size and shape of the mount during the construction. The torso mount provided the majority of the support for the parka at the shoulders and was made from archival Klug gummed paper tape, which is built up like paper maché and has similar properties once dry. The process of building up the mount is shown in Figure 11. The process of building up the lightweight paper torso. A: The basic polystyrene mannequin used as a former. B: Plastazote and polyester wadding added to pad out the former to the desired shape and size. C: Cling film wrapped over the whole surface to form a separation layer. D: The paper shell being built up over the mannequin former. E: The paper mount after removal from the former with one metal armature attached through the shoulder. Photo: ©Scott Polar Research Institute, University of Cambridge. A polystyrene mannequin torso, sourced from the museum’s storage, was used as a base and was padded out with Plastazote and polyester wadding. The wadding was covered with cling film in order to create a smooth surface and release layer between the padded base and the Klug tape. Five layers of Klug tape were applied to the mannequin over three days, and were enough to create a lightweight yet rigid mount. Once complete and dry, the paper mount was cut up the back and opened to release it from the base. The opening was then sealed with an additional layer of tape both inside and outside the mount. The bottom was trimmed so that it would not be seen on display and covered with a layer of tape to soften the sharp edge. The torso mount was made smaller than the parka because the bottom opening of the parka was smaller than the shoulder and chest. This also made attaching the sleeve supports to the torso easier (see section 6.3). Additional pads to support the gut skin were made of white cotton jersey filled with polyester wadding. During installation, the pads were attached to the chest, upper back and sides of the torso with Velcro, once the mount was inside the parka. The soft side of the Velcro was attached to the paper mount so that it would not scratch the interior of the parka when the torso mount was slid inside the garment. The detachable sleeve supports were made from aluminium armatures covered in soft padding. The armatures were custom built by the metal workshop at Mackays, an independent builder’s merchant in Cambridge. Three millimetre thick rods of aluminium were chosen because the metal is lightweight and inert, and can be easily bent into shape. A 70 mm aluminium washer was welded near the end of each of the rods. The ends of the rods were threaded to accept specially made wingnuts. Holes were punched in the paper torso mount at the shoulder to accept the threaded end of the armatures which were secured with the wingnuts on the inside of the mount (Figure 12). 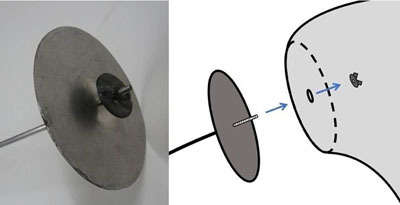 Structure of the sleeve armature showing the metal rod with fixed large plate and wing nut to attach the rod through the shoulder of the paper torso. Photo: ©Scott Polar Research Institute, University of Cambridge. The rods were bent into shape and cut to length, just above the cuff of the parka. The armatures were loosely wrapped with polyester wadding. Bondina covers were sewn over the wadding to create a smooth surface. Due to time constraints, the Bondina was secured at the top to the aluminium washers with archival double sided tape. The Wager parka hood was fairly rigid and needed minimal support to maintain its rounded shape. A simple hoop shape was created from a strip of over 12 layers of Klug paper applied in alternating directions. The strip was curved into an oval and secured until dry. Two additional layers of Klug tape were applied to reinforce the shape. The oval was flexible enough to allow it to be compressed to insert it into the hood opening and then expanded fully to support the largest part of the hood. It was then secured to the torso mount with Velcro. To make the mount visually unobtrusive, the paper hoop and neck of the torso mount were toned to match the parka with watercolours. The mount was assembled inside the parka by first sliding the sleeve supports up through the base of the parka and into the sleeves from the shoulders. The torso mount was inserted into the parka with the front and back pad already attached, and the sleeve supports were attached to the torso by the wingnuts. The side pads were added once the positions of the arms were set and secured. The mount assembly was lifted onto a custom-made steel T bar which was designed to fit within the paper mount. The mount at the shoulders was supported by the cross piece of the T bar which was made from curved half-pipe and was welded to a steel pole. The pole fitted perfectly into the anchor already installed in floor of the display case. Finally, the hood mount was installed once the parka was upright (Figure 13). The completed mount (left), and the Wager parka on the mount (right). Photo: ©Scott Polar Research Institute, University of Cambridge. The total cost of the Wager parka mount was about £110. The Klug paper tape and padding material was about £30 and the metal work, £80. This compares very favourably with the cost of a bespoke archival mannequin made by an external specialist. The paper mount has the additional advantage that it can be used both on display and as a storage mount. The paper maché mount was able to hold the sleeve supports because both they, and the parka itself, were very lightweight. If sturdier arm supports were needed for heavier clothing, an archival rigid material could be laminated into the paper maché shoulder to strengthen it in this area. For a small museum without sophisticated analytical equipment or a dedicated research budget, it can be difficult to justify the expense of commercial analysis of artefacts. However, it is sometimes possible to have single or small numbers of samples analysed as part of a large research programme being run by another institution at little or no cost to the museum. In this case, BioArCh, at the University of York, requested samples from the Polar Museum for a completely different research programme, and the gut parkas were analysed as a quid pro quo. In another example, the Polar Museum contributed samples to another large research programme, Heritage Smells at the UCL Centre for Sustainable Heritage. In this case the museum benefitted from the results of Volatile Organic Compound (VOC) analysis of a storage area, while the Heritage Smells project team were able to use the samples to test a new analytical technique which they were developing. Another route for arranging analysis of samples can be through conservation student placements. Often students are encouraged to carry out analysis as part of their projects and their source institution may have the facilities for this work. In this case the SEM, EDX, and FTIR analyses were carried out at UCL where the conservators were enrolled in an MSc programme. Student dissertations or extended projects may be based around collection material in the museums where students are placed, and this also can be a very useful way to gain enriching information about the collection. It is important to ensure that any arrangement like this is genuinely beneficial for both parties, so that the conservation student is not exploited but develops their skills and portfolio while at the same time doing work that benefits their placement host museum. Informal research arrangements are by nature mutually beneficial and often quite opportunistic, with a fair degree of luck involved. It is important to recognise that it is not possible to pursue a larger research strategy in this way, as nothing can be guaranteed and it may take a long time for results to accumulate from several places. In this case the conservation work on both parkas was completed over about a year from 2013 to 2014, but the final analytical results were not available until 2016. The information which comes from informal research arrangements is shared between the small museum providing the samples and the research facility which carries out the analysis. This gives both a claim on the results. If a museum provides samples which are used in developing new techniques, as described above, the research institution understandably will want to publish their novel method first. It is important to ensure that results from any analysis are available in a format which the museum can use. Analytical spectra are often produced on software which works with specific equipment and a small museum will not be able to open or manipulate such files. It is essential to agree in advance how the data from research is to be used and stored to avoid future loss of goodwill which can undermine professional relationships. The conservation and analysis of the two gut parkas at the Polar Museum was truly done on a shoestring. However, it was possible to conserve both parkas fully by using low-tech repair and reshaping methods and adapting low-cost mount making techniques to suit the needs of these artefacts and the display space available. The student conservators also added value to the project by the additional research, experimentation, and analysis they were able to do during their placements, which a working conservator might not have time or resources to undertake. Highly specialised analysis was also available at little or no cost by tapping into research networks. This approach is unpredictable and by sharing the results with research colleagues, the Polar Museum relinquished some control over them. However, without these networks, the analysis would never have been done and the value of the research and treatments on the gut parkas at the Polar Museum has proved to be hugely enriching. The parkas capture people’s imagination, and because of the conservation and analytical work they are now both safe and accessible, and provide fascinating content for numerous successful events in the museum for different audiences, including sessions where they can be viewed outside the showcase. Demonstrating the low-tech experiments with sausage skins has proved an engaging way to introduce the technology of the parkas to the public before presenting information gained from the high-tech analysis which was done off-site. The parkas have become a highlight in the museum, and amply demonstrate the potential value of conservation networks for small museums. The authors are very grateful for a grant from the University of Cambridge Museums to fund the conservation treatment of the parkas. We also gratefully acknowledge the analytical support from Matthew Collins and Ursula Arndt of BioArCh at the University of York, and James Hales, Caitlin O’Grady, Renata Peters, Dean Sully, and the technical support staff of the Institute of Archaeology, University College London. Grateful thanks are also due to the staff of the Scott Polar Research Institute and the Polar Museum for practical help during the project. The conservator at the Polar Museum is funded by the United Kingdom Antarctic Heritage Trust. Blumenstein, RP. 1987. Fishskin and Gut the Yup’ik way. In: Hickman, P (ed. ), Innerskins/Outerskins: Gut and Fishskin, 18–27. San Francisco: San Francisco Craft and Folk Art Museum. Available at: http://www.pathickman.com/images/innerskins_outerskins_guts_and_fishskin.pdf [Last accessed 27 September 2017]. Bowman, M. 2015. Voices in Flight. The Heavy Bomber Offensive of WWII. London: Pen and Sword Aviation. Buijs, C. n.d. Clothing from East Greenland. Leiden: Digital Publications of the National Museum in Ethnology. Available at: http://materialculture.nl/sites/default/files/files/201606/clothing_from_east_greenland_0.pdf [Last accessed 27 September 2017]. Burns, JJ. 1987. Arctic Marine Mammals: An Inside Look. In: Hickman, P (ed. ), Innerskins/Outerskins: Gut and Fishskin, 28–30. San Francisco: San Francisco Craft and Folk Art Museum. Available at: http://www.pathickman.com/images/innerskins_outerskins_guts_and_fishskin.pdf [Last accessed 27 September 2017]. Cruickshank, P and Saiz Gomez, V. 2009. An early gut parka from the Arctic: Its past and current treatment. Prepared for the ICON-ethno workshop Scraping gut and plucking feathers: the deterioration and conservation of feather and gut materials, 6 October 2009. 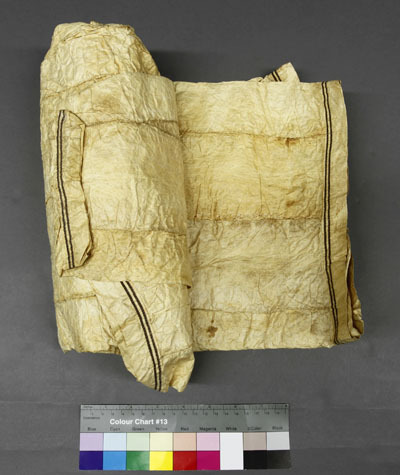 Available at: https://icon.org.uk/system/files/documents/pippa_cruickshank_vanessa_saiz_gomez-an_early_gut_parka_from_the_arctic_its_past_and_current_treatment.pdf [Last accessed 24 September 2017]. Florian, ME. 1990. The effects of freezing and freeze-drying on natural history specimens. Collection Forum, 6(2): 45–52. Florian, ME. 2002. Fungal facts. Solving fungal problems in heritage collections. London: Archetype Publications. Florian, ME. 2007. Protein facts. Fibrous Proteins in Cultural and Natural History Artifacts. London: Archetype Publications. Fox, M. 2001. The optical properties of solids. Oxford: Oxford University Press. Issenman, B. 1997. Sinews of Survival: The Living Legacy of Inuit Clothing. Vancouver: UBC Press. Jackson, K and Hughes, A. 2009. Gut Reaction: The history, treatment and display techniques of gut garments at the Pitt Rivers Museum. Prepared for the ICON-ethno workshop Scraping gut and plucking feathers: the deterioration and conservation of feather and gut materials, 6 October 2009. Available at: https://icon.org.uk/system/files/documents/kate_jackson_andrew_hughes-_gut_reaction_the_history_treatment_and_display_techniques_of_gut_garments_at_the_pitt_rivers_museum.pdf [Last accessed 24 September 2017]. Lin, LY. 2010. Evaluation of Methods to Identify Native-processed gut in Alaskan artifacts. The Ethnographic Conservation Newsletter of the Working Group on Ethnographic Materials of the ICOM Committee for Conservation, 31: 2–4. Nungak, Z. (ed.) 1983. Northern Quebec Inuit Elders Conference. Inukjuak: Avataq Cultural Institute. Reed, F. 2008. Embellishments of the Alaska Native Gut Parka. Textile Society of America Symposium Proceedings, 127. Available at: http://digitalcommons.unl.edu/tsaconf/127 [Last accessed 24 September 2017]. Reed, R. 1972. Ancient skins, parchments and leathers. London: Seminar Press. Supianek, C and Ganiaris, H. 2013. Build your own paper mannequin. ICON News, 45: 29–31.